Benefit is a brand I wouldn't typically associate as a high-street brand as the products are pricier than your Rimmel's and your Bourjois' which tend to stick below or around the £10 price range. However, I am a massive fan of their products as a naughty, luxury treat every now and then. I was bought Benefit's They're Real mascara for my 21st birthday last year (thanks Mum!) and I fell in love as soon as the applicator wand hit my lashes. I love how it creates loads of length in my eyelashes without looking clumpy or spider-y, and the length lasts most the day too. I've always been fairly happy with high-street mascaras and don't get me wrong, you can get some great ones for around £8. But when I used They're Real it just managed to top anything I'd used before. Between uses, I've also used Bourjois Volume 1 Seconde which I like, but I always end up going back to They're Real and enjoying the outcome more. Then one day in the last week or so, I was scrolling through Twitter and read that Benefit was bringing out a new mascara. The Roller Lash. It caught my eye but I kept scrolling and probably watched a cat video or tweeted what I'd just eaten for lunch instead. Then I kept seeing Benefit retweeting users of the new Roller Lash mascara who were raving about how good it was and even saying it topped my beloved They're Real. Surely not?! I had to find out! With a sample size free with Elle magazine in their March edition I really couldn't resist. So today, I tested them against each other. Yes, I went to work with They're Real mascara on my left eye and Roller Lash on my right. The things I do for make-up! My first reaction was that they are both quite similar. One thing I preferred about the Roller Lash mascara however was how it also managed to volumise AND lengthen my lashes WITHOUT making them clumpy. Magic. I also prefer the brush, which is slightly curved and doesn't have the little bobbly part on the end that They're Real has. You can see what I mean by that awful description in the photos to the right. Despite these slight preferences, I still thought the instant outcome was actually fairly similar. However, after a long 8-hour day at work, I've checked the lasting power of each mascara and the Roller Lash has definitely outdone They're Real on this. My Roller Lash eyelashes still look as long as when I first applied it this morning, whereas the They're Real have started to fall. (Let's be honest, they still look fab though). So Benefit have done the impossible. They've beaten their own infamous They're Real mascara. Well done! Grab your free sample size Roller Lash mascara in Elle magazine NOW! 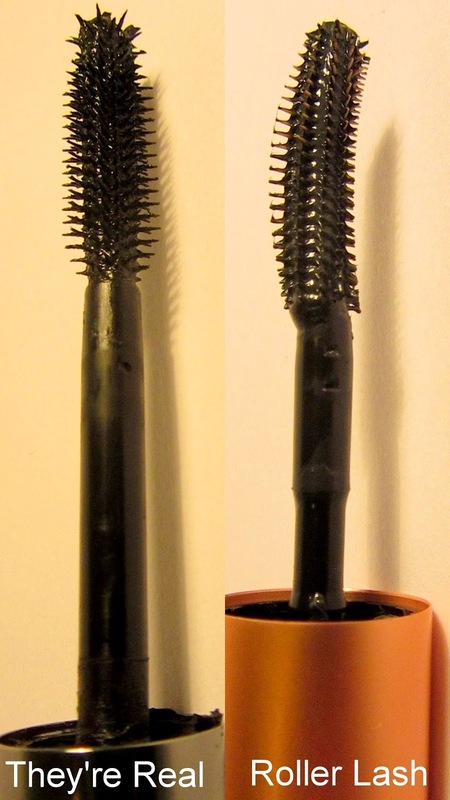 I'm not a huge fan of the They're Real as I find the spikey end to the brush hard to wield, however the results of the Roller Lash look amazing on you! 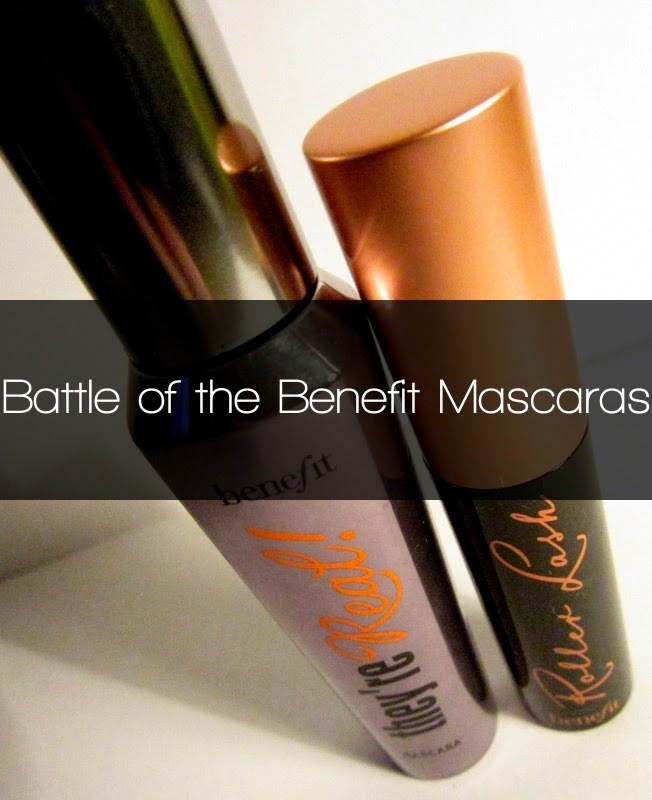 And as I love Benefit in general anyway I think Im'a have to get me a Roller Lash to try. Elle here I come! This is a really helpful cpmparison post! Although I haven't tried They're Real, I really am loving their Roller Lash Mascara. Can't wait to buy the full size version when it's released! Glad you liked it Danielle :) yesss me too, I can see it becoming a staple in my makeup bag!